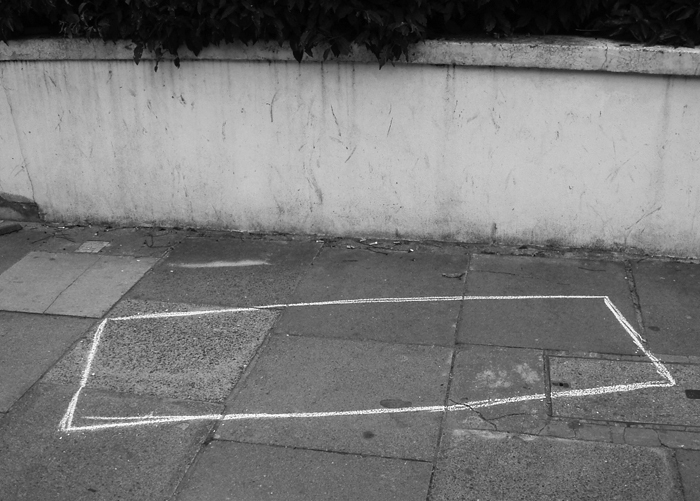 Pavement with chalk rectangle: Percy Road, W12, 2007. Photo © Jack Robinson. One morning a few months ago a packing crate was delivered to the house of the woman, Emma, who lives here. About five feet long by two feet wide by three feet high, it could have contained a library of pornographic videos, or two folded illegal immigrants, or everything she had ever lost. Apart from hers, the only address on the crate was that of a transport company in Tallinn, Estonia. The van driver and his mate unloaded the crate onto the pavement but said they were not obliged to carry it up the steps into the house. Emma waited for her boyfriend to come home. At lunchtime the crate was still there, but when she looked out of the window at five o’clock it had gone. She never told her boyfriend about the crate, and shortly afterwards they broke up.